My mom is awesome. I remember once, when I was pretty young, it was warm and rainy out one day. She told me and Amy to take off our socks and shoes and go outside to splash in puddles in the driveway. We happily obliged! She’d always let me lick the beaters when she was baking chocolate chip cookies, let me play with her jar of buttons while she sewed, made us play dough from scratch, let us make a huge mess of it on the kitchen table, and always had hot cocoa waiting for us when we came inside from sledding. So, yeah. Awesome. Basically the kind of mother I’d want to be, if I wanted kids that is. She’s also amazing with her many grandkids (8 and counting). She makes them tea parties and play dough, reads them books, and lets them have giggly sleepovers at Grandma’s. I could probably talk endlessly about how much I love my mom. My mother-in-law is the sweetest human being ever. I love her, too! Anyways, for Mother’s Day every year (and their birthdays), I ask my mom and my mother-in-law what they’d like as a treat. My mom requested Blackberry Lemon Cupcakes and my mother-in-law, Lori, asked for “something lemon”. I made Lori a Lemon Vanilla Cake (recipe coming soon!) and made mom her requested cupcakes plus these, because I was dying to try them. I saw these on Pinterest and thought it was a fantastic idea. Mom loves angel food cake, and I love making cupcakes. I used a starch paste method to stabilize the whipped cream since I wanted them to last throughout the entire weekend. It’s really easy, and handy when you’re traveling a long ways with food. 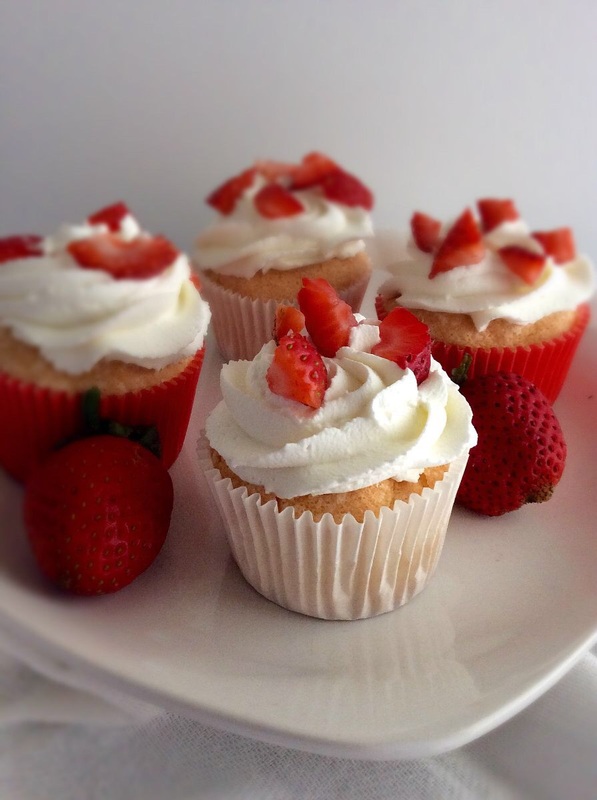 I inserted a strawberry by using the cone method and gently pushing the strawberry inside the cupcake, instead of a filling. It was really cool to cut them in half and see how it turned out! 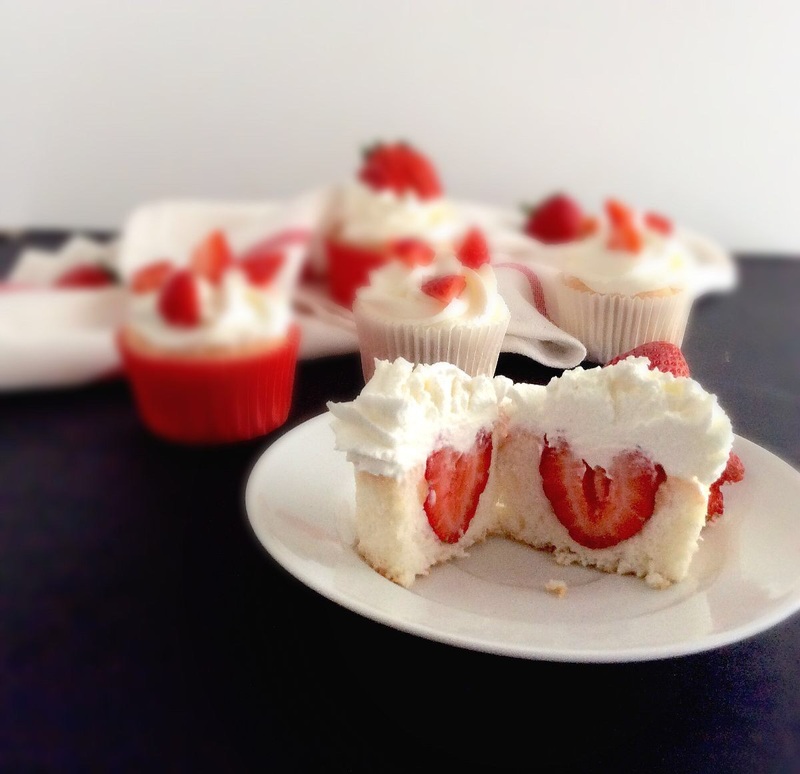 If you want, you can just put some sliced or chopped strawberries on top. It’s a little easier and tastes similar. 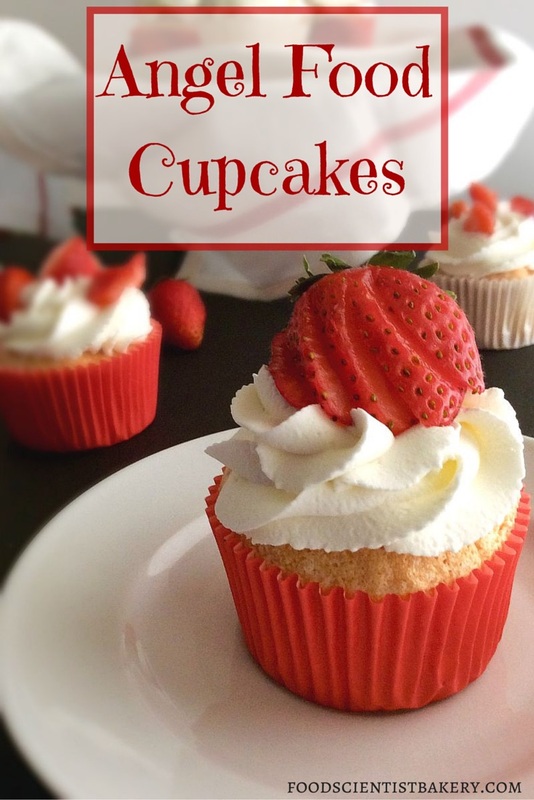 They’re fluffy, light as air cupcakes that definitely taste heavenly! Preheat oven to 350 F. In small bowl bowl, sift flour and cornstarch. In bowl of electric mixer, beat egg whites, water, extract of choice and cream of tartar on medium-high until soft peaks form. Slowly add sugar while beating on medium until stiff peaks form. Sift a small amount of flour mixture into bowl and use a spatula to gently fold into egg white mixture. Continue until all of flour mixture has been incorporated. Divide batter among paper lined muffin cups, filling them full. Bake for 15-18 minutes until golden. Cool completely. Heat sugar, cornstarch, and ½ c. of cream in small saucepan over medium heat until thick and bubbly. Remove from pan and cool in fridge for 30-45 minutes. Refrigerate your bowl and beaters, too, for best (and quickest) results. Once the starch paste is cool, whip the rest of the cream in chilled bowl until thickened. Slowly add starch paste and beat well until stiff peaks form. This cream can be kept in fridge for 3 days or left out for up to 3 hours. Assembly: If desired, use the cone method to fill cupcakes with strawberries. 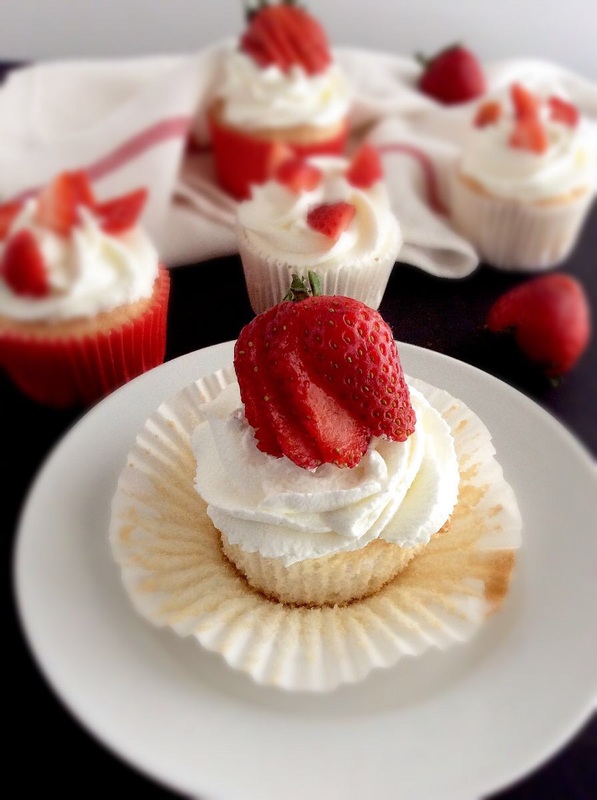 Frost cooled cupcakes with whipped cream and sliced or chopped strawberries. Eat or place in fridge for up to 3 days. Glad I made some happy memories for you. I guess I am very domestic at heart! You did! I’m pretty domestic, too. It’s nice to enjoy cooking and cleaning, though, because someone has to do it! Tablespoon. I use a small “t” for teaspoon and a capital “T” for tablespoon. Hope that helps! Tried this…tasty and so gorgeous ! Thanks for sharing. I’m so glad you liked them! They’re very pretty, and I love the lightness of angel food cake. 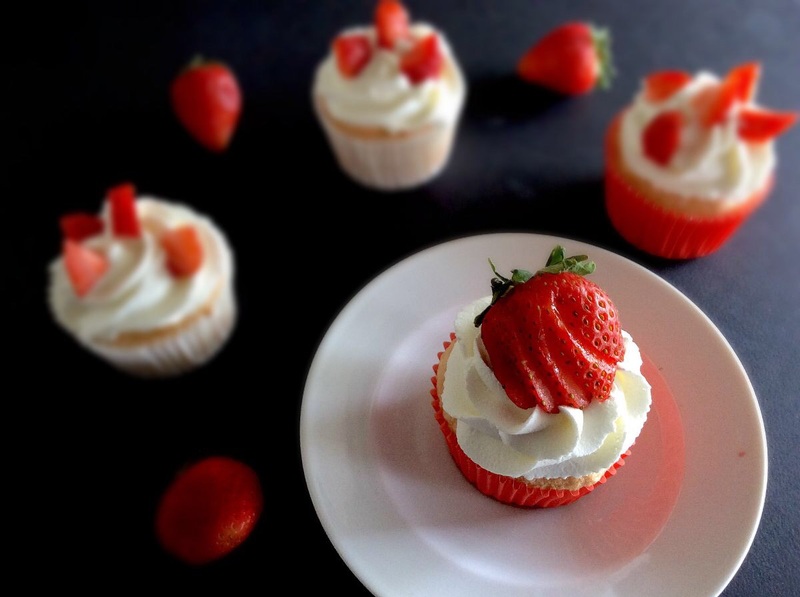 Can you explain more about how to get the strawberries inside the cupcake? The cupcakes are pretty fluffy and soft, which makes it all easier. Enjoy! Can a person double the recipe or make two different ones. Sure thing! I just did that, actually I tripled it, and it worked well. It’s a lot of egg whites, so just be sure to put each egg white in your mixing bowl to avoid getting 1 yolk in 9 egg whites. The fat in the yolk will keep them from getting fluffy. Good luck! Just made these…quadrupled the recipe & got 28 cupcakes. They turned out perfectly! Thank you so much for this recipe, it is sure to be one of my family’s favorites! That’s great!! I’m so glad to hear that!